Home International Solidarity Victory! There will be no more dogs of war! Victory! There will be no more dogs of war! Thanks to a concerted campaign led by human rights organisations in Palestine, pro-Palestinian media and supported by the 2,500 strong petition signed by supporters of the Palestinian Animal League, the company exposed for sending training and supplying “attack dogs” to the Israeli armed forces has stated that it will no longer provide dogs for this purpose. 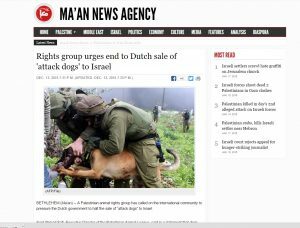 Reported in Dutch press, the owner of Four Winds K-9, a company which had which had previously proudly promoted that it was responsible for 90% of all dogs supplied to the Israeli army, said “we never had the intention to violate human rights”. The statement was made in response to the furore which arose as videos were publicised of dogs being deliberately set on young people and peaceful protesters in the West Bank.  The campaign was largely led by Al Haq – the longest established human rights organisation in Palestine, with PAL becoming involved in order to highlight not just the human rights abuses this use of dogs was causing, but also the impact that it has on animals, and society more generally. PAL argued that the use of dogs in this way not only impacted upon those people who were attacked but also on the animals themselves. Another part of the problem, PAL said, was the long-term effect that this abuse of animals and people has within Palestinian society. From a young age, Palestinian children are taught to be afraid of dogs. And with good reason because, in Palestine, everyone knows of someone who has been attacked by a dog set upon them by members of the armed forces. The result of this is that dogs might be both feared and hated which, in turn, leads to high levels of violence towards dogs; sometimes in the form of municipality-led lethal control of stray populations as well as in the form of individuals taking matters into their own hands and hurting or killing dogs seen as either a threat or a nuisance. 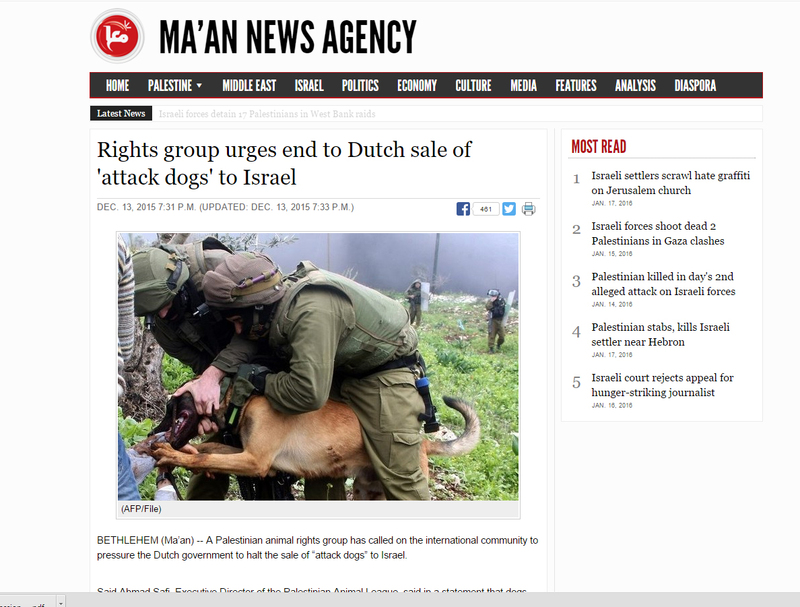 “We are delighted to hear that the company responsible for sending the dogs used in attacks against Palestinians has not only agreed to stop providing such dogs to the Israeli army, but have publicly voiced their concern over the use of the animals in human rights violations. As an animal protection organisation, we are deeply concerned about the use of animals as weapons in any context and as Palestinians, it is vital that we work to ensure our human rights are protected. This is a great outcome for animals and people and we would like to thank Four Winds K9 for acting upon the concerns raised”. PAL would like to thank everyone signed the “No More Dogs of War” petition – this is a fantastic result and shows what can be achieved when groups and individuals work together to protect animals, people and the environment! Find out how you can support PAL’s work to protect street dogs in Palestine here.